Ed Templeton is getting into furniture light fixtures. Loyal Pawns with six figure incomes be on alert. 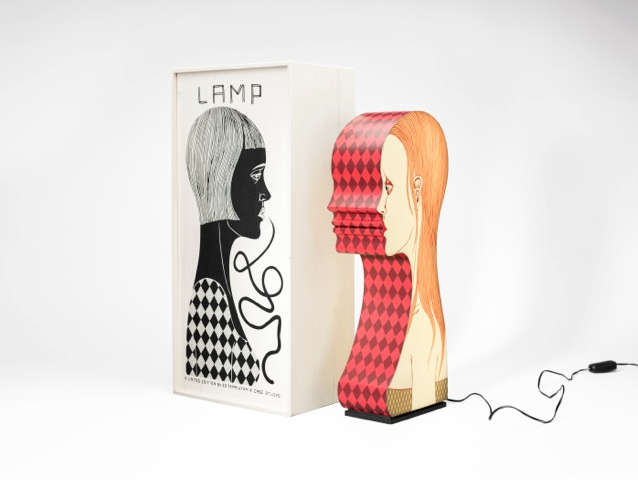 Case Studyo is producing a limited run of 100 lamps. The piece is a wooden and silk screen box 20.5″ high and features two silhouetted women in a style that has been on Toy Machine decks and prominant in Templeton’s painting. This would make a great floor lamp at VSB HQ but the likely-hood of a rouge skateboard smashing it to pieces are quite high. For €969(+€75 shipping to the US, $1412.00 in Dollars ) this lovely lady can be yours. That price is unfortunate. I would buy it if was $1,312 cheaper!